These miniatures are again all from the JD3 Perps and Muties range with a Slaughter Margin character for good measure. First up we have the incorrectly named 'Lorien Speck' whose name tag says 'Frank Zit', Judge Dredd fans may well remember him from as 'Big Frank Zit' the leader of the Zits gang and the Judge Dredd story 'West Side Rumble' 2000AD Prog 434 1985 who battled it out with the Sharks gang before Justice Department broke up their juve rumble. It's nice to see another miniature who is a carbon copy of the comic illustration, it makes it much easier to spot an irregularities. Oh yeah it true 1980's fashion he is armed with Nunchaku which 1980's boy didn't make his own? For those of you are thinking who was 'Lorien Speck then? He was a Tom Selleck look-alike featured in the Blockmania story 2000AD Progs 236-244 1981 in the lead up to the Apocalypse War epic. 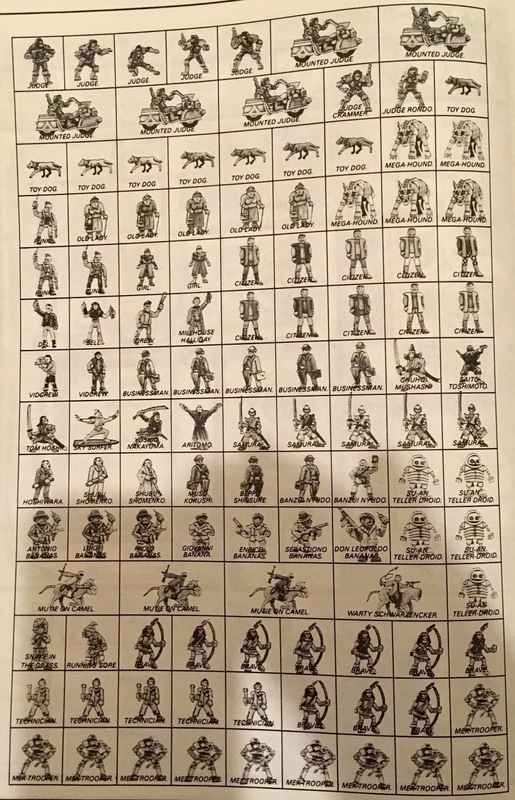 Next up we have 'Zuggy Spotz' another incorrectly named miniature and again his tag reveals the true name, he is 'Crazy Joseph' another member of Big Frank's gang the Zits appearing in 'West Side Rumble' 2000AD Prog 434 1985, check out the comic image above. At first I thought he was a Red Indian when I found him in my Judge Dredd miniatures box as looked like he fitted in with my Slaughter Margin Red Indians. 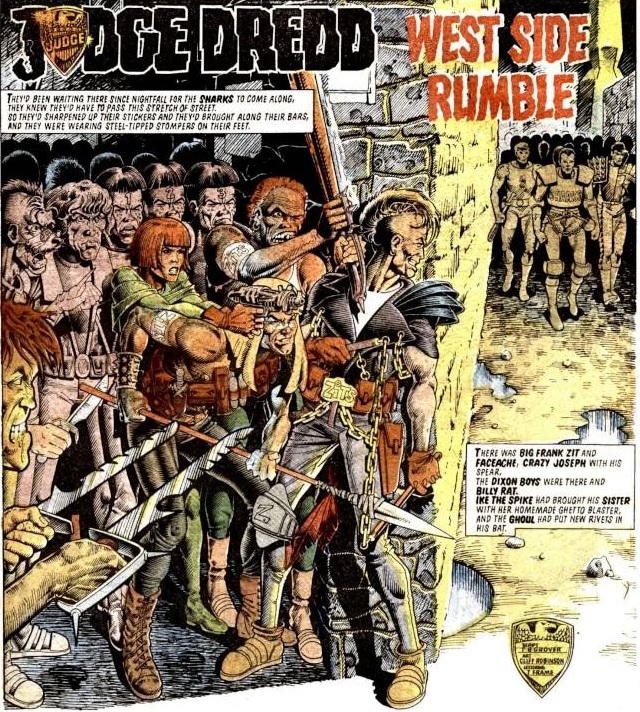 I think Zuggy Spotz was a Mega Block name in a Judge Dredd story somewhere but I haven't the time at the moment to trawl through every issue to find it, well not today anyway. Lastly we have 'Brother Obee' of the 'Mutie Brotherhood' in the Cursed Earth saga progs 65-66. Also Kelv is a variant of this miniature. 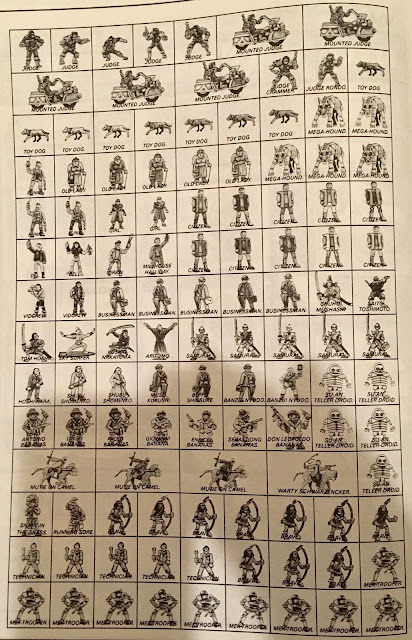 I have already painted all the members of his gang, Morgar, Brother Jobee, Brother Gomorrah, Mutie with Bazooka, Mutie in Dress and Squid Face. This completes the JD3 Muties code for me. And finally I finished off a Ground Zero Games SL-09 COLLATERAL DAMAGE PACK Child as every Judge Dredd scenario is going to need some collateral damage (don't tell the wife I am painting these). I have loads of these from 15+ years ago almost finished and size they fit beautifully with the Oldhammer Citadel Miniatures before the scale creep. Another cracking blog! You pack so much fascinating information into to these. 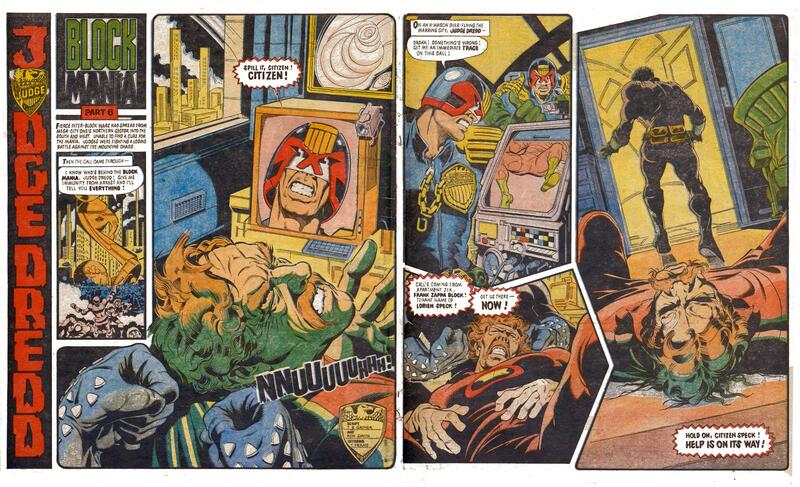 I never knew even the random perps were taken straight from the pages of 2000AD.